1962, 1963, and 1965 Missouri State Champion. 1965 Arkansas State Champion. 1962 and 1963 World Series of Sport Fishing Runner-up. 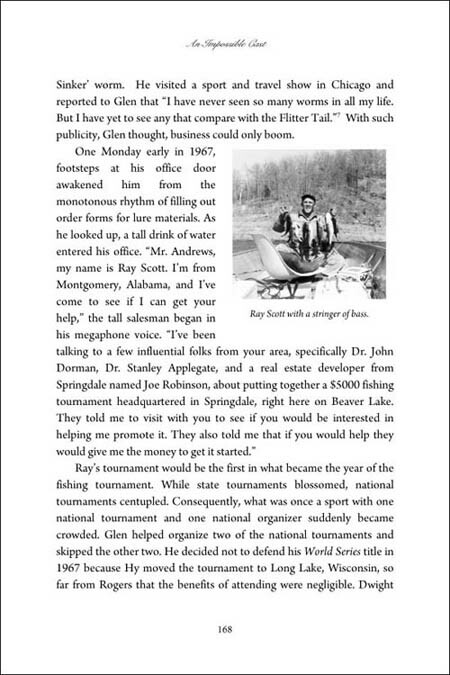 1965 and 1966 World Series of Sport Fishing Champion. Innovative lure manufacturer. Acclaimed outdoor writer. Jerry McKinnis, host of The Fishin' Hole, described Glen Andrews as "simply the greatest bass fisherman I've known, and I've known them all." Bass fishing legend Bill Dance insists that Glen Andrews "is my mentor, my friend, my advisor and absolutely has always been among the top contributors to the success of the name Bill Dance!" Bobby Murray, 2001 Bass Fishing Hall of Fame inductee, describes Glen as "the first true, professional bass angler." Glen Andrews dominated early tournament bass fishing, yet most fishermen have never heard his name, those of his remarkable competitors, or the history of professional fishing before Ray Scott's first tournament in 1967. An Impossible Cast, written by his son, D. Shane Andrews and Jeremy Miller, fills all of the gaps. 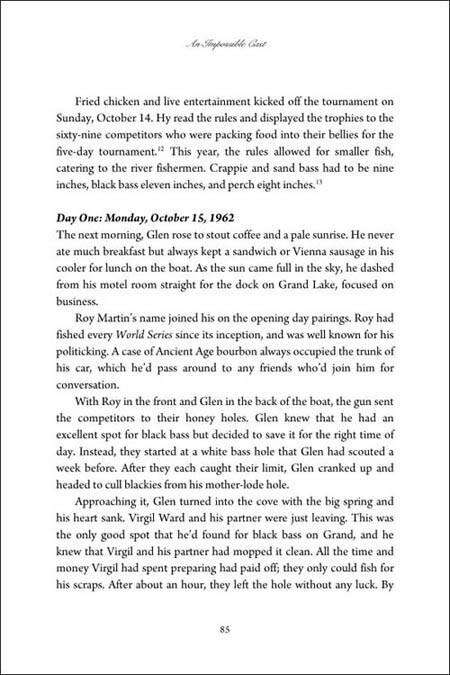 What so many bass fishing fans have missed are groundbreaking sport fishing history, Glen's competitive fishing insights, and most importantly Glen's American struggle, his meteoric rise and fall to fame and obscurity, which will touch all readers with the spirit of human determination. 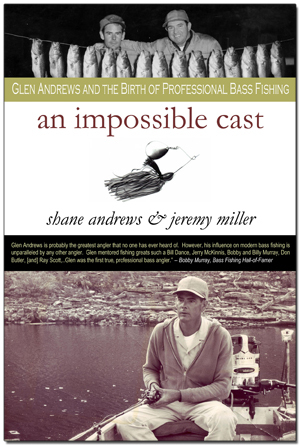 An Impossible Cast gives readers an observer's seat in Glen's boat to witness the previously undocumented creation of a bass fishing Goliath and the unfolding of the birth of professional bass fishing. animpossiblecast.com develops Glen's persona further, expanding upon the book with pictures, video of Glen telling hunting and fishing stories, articles from his Anglers World column, and our blog providing book updates and expanded history on early professional sport fishing that we could not include in the book. 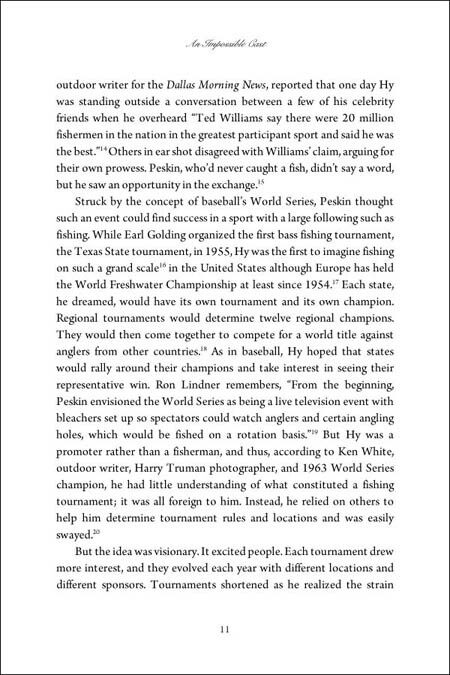 And of course the link to The Whitefish Press where you can buy the book!